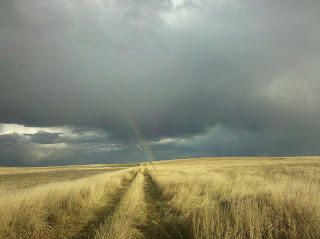 North Dakota, this year, was beautiful! Sometimes, one gets lucky with a camera and captures a shot like the one above. As I travel over the country, I often wonder about those that don't get a chance to see all this. Most of them are perfectly content to stay where they are and see the beauty in their own hometown and area, and that's fine by me. One of the reasons I like to travel and hunt is to see new country, meet new people, hunt new habitat and terrain. I think if we stay with what we know, that's all we will ever know. Tied in with the idea of traveling and hunting around the country, is my concern for the future of the sport. Where are the young guys, the kids, the women, the boys and girls? Of course, I know that my hobo-hunter lifestyle is pretty exclusive- after all, having the time, inclination and where-with-all to travel and hunt is not something you see in young marrieds or middle aged men and women who have jobs and careers. So, I'm not advocating my kind of hunting, but I am strongly pushing for introducing young people to the sport. I am all for showing young people where meat comes from and how it gets to the table. I am a huge proponent of explaining, through action, that we are the top of the food chain and we harvest not only grains and fruits a vegetables, but, also, meat. My pup, Bandit, and his limit of Sharptail Grouse. 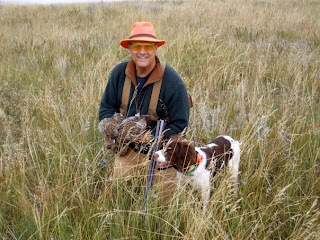 My little niche, of course, is in the harvesting of game birds and using the genetic make-up of bird dogs to facilitate that. Granted, I lean more toward the dog aspect, and, in fact, I'm not much of a meat eater, but the sport is valid and deserves to be promoted and preserved. The Old Ball and Chain and her first bird on a covey rise! To do that, we need to take someone hunting and make it the most pleasant and pleasing experience we can. We need to show them the effort that goes in to harvesting game birds- the respect shown to the birds, the land and the dogs. The traditions of hunting with bird dogs, the unwritten rules, the courtesies. I'm convinced once they are introduced properly, many will become lifelong proponents of our great sport and, who knows, maybe they will grow up to be a hobo-hunter, too. My pup, Gritz, and her first Woodcock. 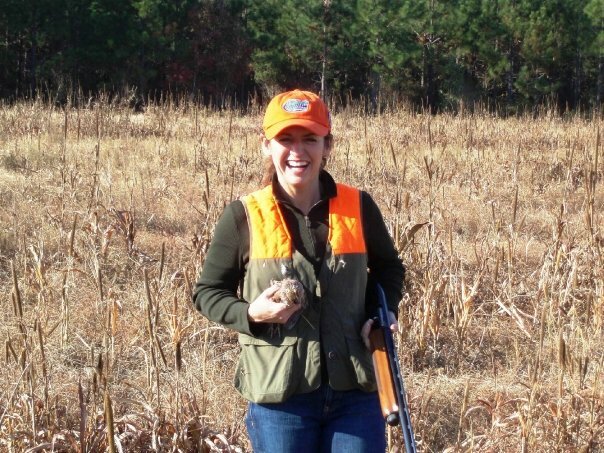 Tomorrow, I have the opportunity to take a young man hunting quail. He's eager and ready to go! He's completed the Hunter Safety Course, he shoots well and he likes to hear about not only the how's of bird hunting, but also the why's. (Full Disclosure: He's my future son-in-law. Perhaps that contributes to his eagerness?) Sponsored by uplanders.com, we will hunt quail tomorrow on an 8000 ac. 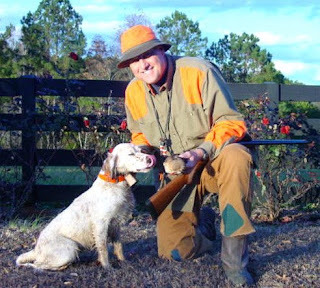 plantation owned by the State of Georgia and managed exclusively for Bobwhite Quail. I am looking forward to hunting a full day with the young man (perhaps imparting a little wisdom) on land that looks like it did back when the huge quail plantations were all over Georgia. Introduction to the lifetime sport! Chukar and Valley Quail, Anyone?